Old Quebec is known as the cradle of French civilization in North America. For 400 years, this walled city has been a center of architecture, heritage, art, and culture. Quebec is a pleasure for the eyes, the soul and the stomach. Samuel walked us through the Old Quebec historic district while giving us insight into the history and politics of Quebec, the traditions of the people, the best dining, the best views, locations of Alfred Hitchcock, Tom Hanks and Leonardo Dicaprio movies, and a full two hours of laughs. At the end of the tour, you pay Samuel whatever you can afford. On our tour, we were an eclectic group from USA, Germany, Brazil, Japan and Canada. After our tour, we agreed that Samuel's A Free Tour Of Quebec was one of the best tours we have experienced anywhere. We asked Samuel to tell us more about A Free Tour Of Quebec. What can you tell us about the history of A Free Tour of Quebec? I used to work at the airport of Quebec city and saw a lot of travelers coming with a smile.I love the history of Québec - walking in the old town. I have been to a private school to get my licenced tour guide permit to make it official and legal. It was an intense class and I learned so much! I have been to other tours in the past on many trips and some of the tour guides just tell you dates and you feel robbed at the end because you are not satisfied. You come back home with information that gets lost in your head. By experience, I know tourist guides can be monotonal Debbie Downers and that's exactly why I've devised this humorous historical tour! I really worked a lot on that trail to make sure it will be fun and educational but not boring. I love my job. It is the best job in the world. With the free tour, people have nothing to lose and can be 100% satisfied. It is a business that works all over the world and you feel that the tour guide really works nicely to make you happy. What do guests see on A Free Tour of Quebec? You will see a good overview of the old town (upper and lower town). Somes off the beaten path areas and also the main attractions. You will learn about Château Frontenac, about some of the important characters of the New France history, about filming locationsin Québec, about funny stories and secrets that happened in the city. You might see a jail, an old Anglican church, etc. What tours are offered by A Free Tour of Quebec? For this year,we offer tours from May to October at Monday to Friday at 10:00 am and 2:00 pm. Next year, I’m planning to do also another completely different tour. 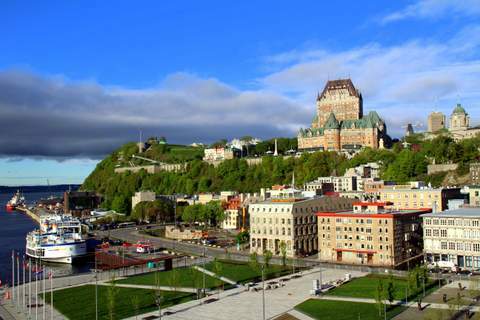 Why is Quebec City such a popular destination? This is one of the oldest cities in North America.The only one with so much of an Europeen touch, so much history about the natives, the New France colony, the British era,the wood industry, the Saint Lawrence River, all the differents sieges! One big Francophone area in an English speaking sea! One of the few places part of Unesco heritage in North America. Once you come, you feel in love with the city. If you dont want to cross the Atlantic to see Europe but you want to feel it, well there you go! People are friendly. It is a pretty safe city where you can go outside without fear anytime during the day. A lot of flower and green areas that let you breathe fresh air. You need to come to understand! We cannot recommend Samuel Dubois highly enough! Samuel's A Free Tour Of Quebec was one of the best tours we have experienced anywhere. We arrived in Quebec on a Holland America cruise to Canada and New England. Read about our cruise at Holland America Canada & New England Discovery Cruise. For gay travelers, Quebec City has a number of gay festivals, venues, saunas and accommodations. Many are listed at Gay Quebec City . Nudist and naturist visitors to Quebec may want to visit Federation Quebecoise de Naturisme.